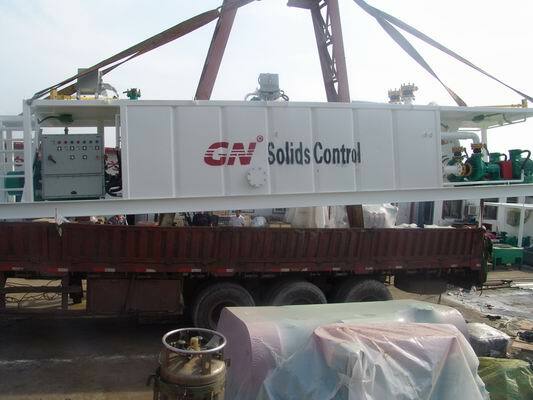 GN designed centrifuge mud tank for oilfield and dredging project, with 1 unit of GNLW553VFD decanter centrifuge(or other model available) and Nemo pump to feed the centrifuge, the centrifuge tank is divided into 2 compartment, the mud after treated by shale shaker, desander/desilter flow or be pumped to compartment 1, then Nemo pumppumped it from the compartment 1 to the centrifuge for processing, the clean drilling mud dropped into compartment 2, which can be pumped to other application or flow to anywhere required. In oilfield application, sometimes mud hopper unit also installed on centrifuge mud tank, the mud which will be feed to centrifuge is with solids smaller than 20 microns, it has been separated by desilter cone. 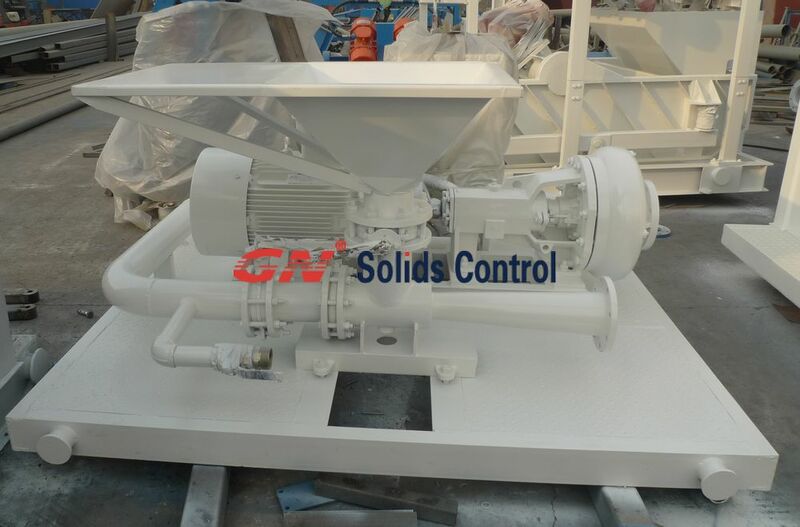 After treated by decanter centrifuge, the max solids remained in the drilling fluids is smaller than 5 microns, it is called “clean mud”. 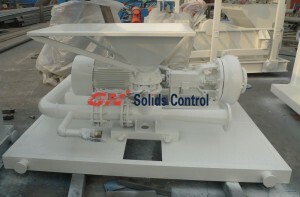 The clean mud may be weighted in pill tank/compartment and mixed by mud mixing hopper & mixing pump. In Dredging project, centrifuge mud tank is applied after dredging slurry separation system, after treated by the desander ( or sometimes desilter), the solids remained in the slurry may be too fine to be separated out by the centrifuge, so you need a flocculation tank before centrifuge mud tank. After flocculation, the mud is concentrate so It is easy for centrifuge to separate it, this is for better performance. So you have to use a positive displacement pump to pump the flocculated mud to centrifuge, otherwise the centrifugal pump will break it off. Sometimes filter press will replace the centrifuge, but efficiency of filter press is not so dissatisfied, so people use large treating capacity centrifuge instead. 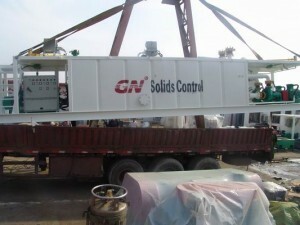 Last week we exported a mud mixing plant to Spain. Every year we design and manufactured hundreds of mud mixing plant for international clients, especially for developed countries, like UK, Australia, USA, New Zealand, Singapore, etc. 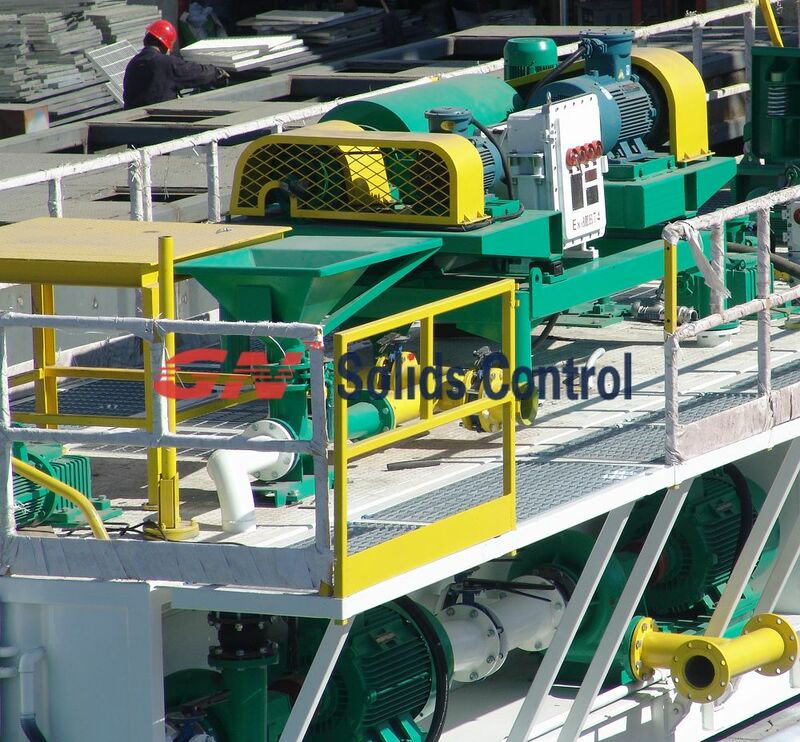 The mud mixing plant is with mud hopper, slurry pump, mud agitator, mud tank, control system, and the painting color can be customized. 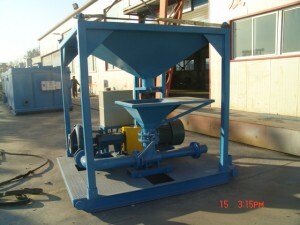 The mud tank dimension is designed by the active capacity clients required. And we should consider the container shipment when design, freight charge is one of the factor clients may care. Except for skid-mounted mud mixing plant, we can also make it portable mud mixing plant, and connected with truck head for convenient transportation. During shipment, we put mud hopper inside the tank by remove the Galvanized Steel Grating, and put the hand rail, stairs on top of the tank. Except for mud mixing plant, we can also produce mud recycling system plant, including shaker tank, suction tank, reserve tank, water tank, trip tank, pill tank and related solids control equipment. 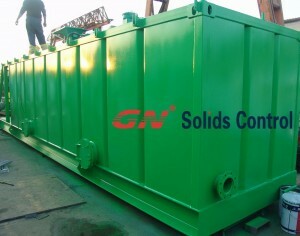 We can also add dewatering unit if clients required.